Nicholson, D.J. Kanagavel, A. Baron, J. Durand, S. Murray, C. and Tapley, B. 2019. 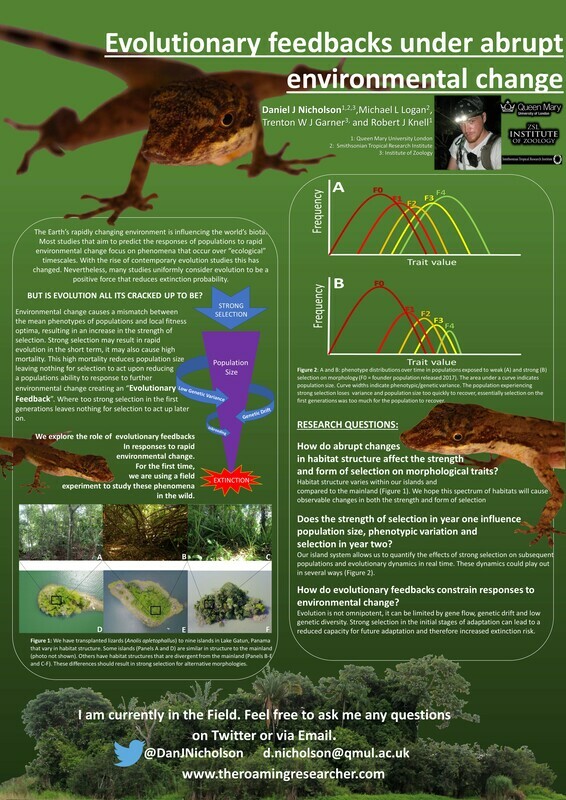 Culture and it's role in garnering support for species conservation: the case of the mountain chicken frog (Leptodactylus fallax) in Dominica. Oryx ​(In Review). Nicholson, D.J. Tapley, B. Jayson, S. Dale, J. Harding, L. Spencer, J. Sulton, M. Durand, S. and Cunningham, A.A. 2017. Development of in-country live food production for amphibian conservation: the mountain chicken frog (Leptodactylus fallax; Muller, 1926) in Dominia, West Indies. Amphibian and Reptile Conservation 11(2),​ 59-68. Nicholson, D.J. Hassall, C. and Fraizer, J.A. 2015. Comparison of a native and non-native reptile species. Journal of Tropical Ecology. 31: 563-566.